(Bridgewater, N.J., April 11, 2018) - The Somerset Patriots have re-signed eight-year Major League veteran left-handed pitcher Aaron Laffey for the 2018 season. 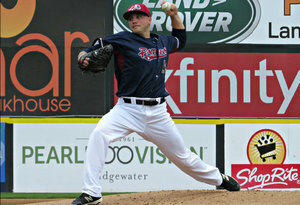 Laffey has pitched exclusively in the majors, Triple-A level or with the Patriots over the last seven seasons. In 2016, Laffey went 6-6 with a 3.82 ERA over 29 games (14 starts) with Triple-A Syracuse in the Washington Nationals organization. The year prior, he went 5-4 over 27 games (12 starts) with Triple-A Albuquerque before earning a promotion to the majors with the Rockies. Laffey carries a 47-38 record over 157 games (114 starts) at the Triple-A level.